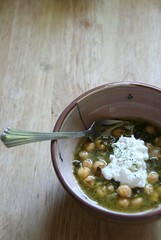 Chickpeas & dill in a bowl from Yria Paros. Meals like this make all my senses feel nourished. Ed. for Kate – I call this “Fake revithia” because I use canned chickpeas instead of soaking them and cooking them myself. Cook beans with herbs and oil on low heat for at least an hour. Add lemon juice after removing from heat, or serve with lemon wedges & fresh bread. Sometimes I serve with a dollop of plain yogurt or cottage cheese.